The LAU Alumni Association in collaboration with the Institute for Women’s Studies in the Arab World and the Heinrich Boell Foundation organized a public screening of Carol Mansour’s latest documentary film: “Not Who We Are”. 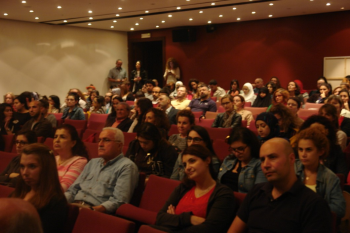 The screening took place on Monday November 18, 2013 at LAU Beirut Campus and attracted a beautiful intellectual crowd which filled the Irwin theatre. To read more about this event read the following story: An eye on Syrian refugees in Lebanon.